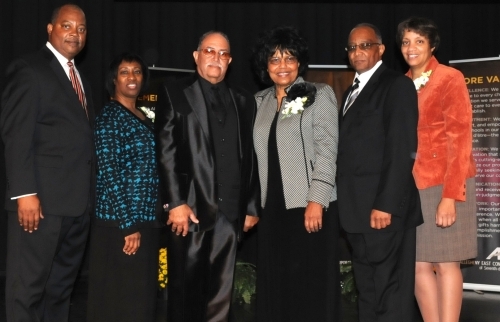 President Henry and First Lady Sharon Fordham (center); executive secretary Marcellus and Maryann Robinson (left) and treasurer Lawrance and Kim Martin (right). Early in the day, they enthusiastically promoted Henry Fordham from executive secretary to president, Marcellus Robinson from ministerial director to executive secretary and returned Lawrance Martin for a fourth term as treasurer. They later approved a second nominating committee report that made Stephen Richardson, administrative pastor at Washington, D.C.’s Dupont Park church, their new ministerial director; Judy Dent, a retired public and Seventh-day Adventist school principal, their new education superintendent; Patrick Graham, pastor of the Sharon church in Baltimore, their new Youth and Children’s Ministries director; and returned Colin Braithwaite, Jackson Doggette, Minnie McNeil, A. Leah Scott and John Trusty to their respective offices. After some discussion, delegates agreed to allow the newly elected executive committee to choose communication and publishing directors. All will serve a five-year term, one of the more significant recommendations of the Constitution and Bylaws Committee that delegates approved. Fordham succeeds outgoing president Charles Cheatham, who capped his 12-year presidency at 76 due only to a three-term limit. In his video report to delegates, Cheatham announced, “I may retire from church employment, but I won’t retire from ministry. I will be doing ministry until I die because my calling is from God,” he said. So far he has served the Church for 54 years, including 46 in AEC, where he completed 14 years as executive secretary before assuming the presidency in 2000. When it comes to dedicated service and longevity, he’s in good company. Fordham, who served as his executive secretary for those three terms, has 34 years in church work. Robinson, who has served as ministerial director for the last four years, pastored for 20 years in the Baltimore-Washington metropolitan area. Martin has headed the treasury for 14 years and many of the departmental leaders and staff have worked for the conference for many years. McNeil, for example, re-elected to lead Adventist Community Services/Inner City Ministries, Prison Ministries and Women’s Ministries until 2017, began her tenure in 1997. Robert Booker, who serves as special assistant to the president and lends oversight to the departmental ministries, has been part of the team for some three decades. During the last four years, the conference saw 3,600 baptisms, organized or reorganized 12 churches, and amassed a gross income of $145.6 million. Membership now stands at 37,000, making AEC the largest conference among the Columbia Union’s eight conferences and the second largest among the North American Division’s eight regional conferences. There are 141 churches, companies and missions throughout the conference’s seven-state territory that serve Africans, African-Americans, Anglo-Americans, Brazilians, Haitians, Latinos, East Indians, Indonesians, Koreans, Romanians and others, all of whom were represented at the session. And despite the impacting economic downturn nationwide, there was a tithe increase of 3.78 percent yielding a total of $123.1 million over the four-year period. Delegates applauded these accomplishments, but a few shared questions and concerns about the use of funds, in that the conference moved from a dilapidated farm house and built a new, $8 million, state-of-the-art headquarters; the need for more renovations to the conference-operated Pine Forge Academy (PFA), which shares a campus with the conference in Pine Forge, Pa.; and the declining enrollment at some of the conference’s 11 elementary and secondary schools. Lolethia Kibble, a member of the Ephesus church in Richmond, Va., summarized the general sentiment of her fellow delegates: “Though the enrollment numbers are down, our students score above the national average on standardized tests and are taught by award-winning teachers. We are still baptizing students and having an educational system is still God’s will for our children. But we must figure out how to do Adventist education better, so that it is affordable, and not a burden on the conference,” she said. In response, Martin reported that the conference spent $6.2 million helping the churches pay 48 teachers and operate their schools during the last four years and another $6.9 million in capital appropriations, tithe rebates and evangelism initiatives at churches and schools conference-wide. Delegates spent the last three hours of the day working page-by-page and article-by-article through the conference’s Constitution and Bylaws recommendations as reported by William Niles, a member of Philadelphia’s Ebenezer church. In addition to extending the terms of office from four to five years, they shortened the term limits from three (12 years total) to two (now 10 years total) and agreed to allow outgoing leaders a 30-day transition period. Though members can share input on the mission, vision and strategic goals of the conference during area town hall meetings that occur midway through the quinquennium and before each session, Niles surmised that the most significant action was establishment of a lay advisory, which he says will meet periodically to share feedback and ideas with conference leadership. For Blane Stoddart, of the Macedonia church in Chester, Pa., the session provided a good place to start the idea-sharing: “The constituency meeting presents an opportunity for lay people to have significant influence in conference business. We really need to look at using mass media to spread the gospel; we really need to look at education and Christian charter schools; and, following Matthew 25, we must grow the church through community service,” he offered.